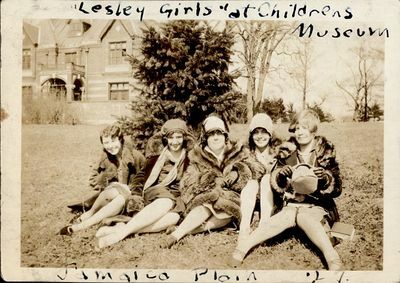 "Lesley Girls at childrens museum, Jamaica Plain"
Five girls sitting in the grass outside the Childrens Museum. There is a building in the background to the left. All the girls are dressed in winter coats, some wear hats and gloves, and one is holding books. Donated by Walter E. Hurley, Sr.